This sizable, complete portfolio is advantageous for any individual who needs to keep flat and transport a variety of essentials. There is ample room for such items as drawing boards, papers, pads, pen/brush/pencil desk easels, palettes, etc. Both external surfaces feature a sizable pocket. One is full size, while the other is 8" in height. 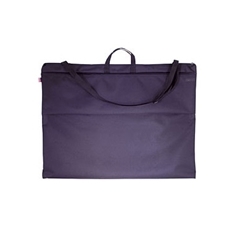 The portfolio may be carried by its shoulder strap or by its secure handles. Made with a water repellent 600 denier fabric.